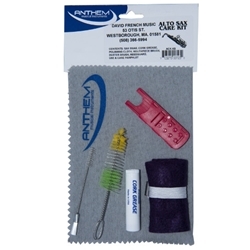 Everything you need to properly maintain your instrument. Each Saxophone Care Kit includes: sax swab, cork grease, polishing cloth, mouthpiece brush, duster brush, reedguard, care instructions. These can be used for either Alto or Tenor Saxophone.